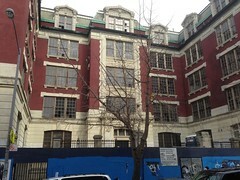 The Wall Street Journal recently reported that Cooper Union had signed a 15-year agreement securing 200 beds in the 500-bed dorm proposed for 605 East Ninth Street, the former home of P.S. 64 and, later, CHARAS. Developer Gregg Singer’s plan for the conversion got the blessing of Community Board 3’s Landmarks subcommittee earlier this month.